The Vegetarian Cottage is owned by a company called Spa Foods, one of Thailand’s biggest producers of faux meat products. For years I’ve been meaning to get to one of their Bangkok restaurants, but they’re all a little inconveniently located out of the city centre. Last time I was in BKK I was determined to get to one, mostly because I’d previously smuggled some of their faux meat products home and was beyond impressed. After a thirty minute wander through alternating scenes of chaos, gated family homes, and seas of 7-11s to find the restaurant, however, I found myself too lazy to enquire about the vegan-ness (it’s a vegetarian place) of the dishes on their extensive menu (which, since it’s not available online, I’ve attached at the end of this post). Also I had already eaten at least 17 meals that day, so I wasn’t starving. What I ended up ordering instead was a spicy banana blossom salad (which wasn’t spicy). It was made with a creamy coconut sauce with no overwhelming flavours, just a moderately sweet curry base with a tangy undertone. Texturally it was sublime, with a mix of crunchy, chewy, and soft components. I knew I’d find a way to work the basic concept of this dish into a recipe at home, and here’s what came out. I used yellow curry paste in my version (they used red), but I’m fairly confident any Thai curry paste would work. As with most Thai food I cook, I go a little crazy with the condiments and toppings, but that’s half the fun. Add herbs and extras as you see fit, but don’t omit the fresh lime juice. I’m a fan of fresh coconut, and when it comes to Asian food I will always choose it over desiccated and dried varieties. I realise not everyone has the time nor patience, but the results are well worth the trouble. I have a double ended coconut grater/scraper I purchased in a Thai market, but a regular ol’ grater will suffice. When you toast this, go about it the same as you would dried coconut. Don’t worry about getting all the moisture out, though – just get some brown on the meat before setting it aside to cool. Mint, chives, coriander, basil (sweet or lemon types), chilli, spring onion, or any other South East Asian herb will work as a topping, so you can be selective. Personally I went for a mix of sawtooth coriander (if you love coriander, seek this extra potent variety out), sweet basil and spring onion. Oh, and I dare you to not be obsessed with fried lime leaves after trying them. Just make sure they’re fresh, not dried (check the frozen section of an Asian grocer). Another possibility is fried garlic, which you can purchase in Asian shops, along with fried shallot. If you make these at home, remember to save the oil from the garlic as it’s great for frying other foods and for drizzling over other Asian dishes (or even steamed vegetables). Shallot oil is pretty ace as well. If you live in or around London, it’s possible to purchase bags of pre shredded banana flower. There are half a dozen or so Vietnamese shops along Mare Street in Hackney which sell this and every other Vietnamese herb you could desire. Alternatively, if you want to stay central, Loon Fung on Gerrard Street (Chinatown) stocks a limited quantity of the same ingredients in the produce aisle as you come through the main entrance. And a quick note on the tofu: realistically you could use anything, but the creamy texture of the softest variety you can work with is best. 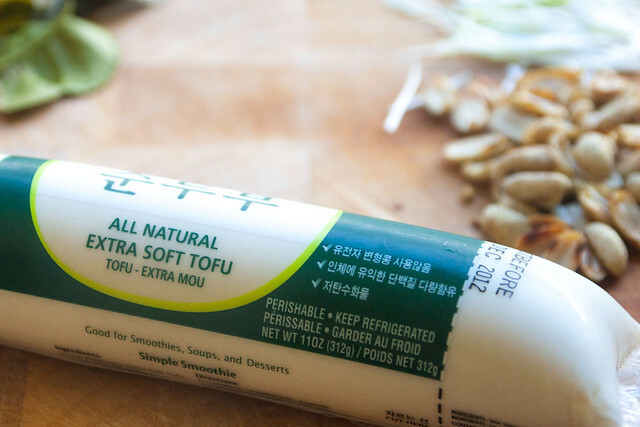 Tubes of soft tofu are perfect because you can cut straight through the packaging with any decent knife, and feed the contents out as you slice. Use the knife to transfer the slices straight to the starch. Incidentally you can use another starch if you don’t have potato flour – I just like the gummy texture imparted by this particular ingredient when it’s fried and then hits some liquid. The first thing you’ll need to do is make the coconut sauce for the salad. Bring the coconut milk and palm sugar to a simmer. When the sugar is dissolved and the liquid is bubbling nicely, add the curry paste and soy sauce. Mix well and simmer a further 5-10 minutes, or until the coconut milk has thickened a little. Tip the shredded banana flower, most of the coconut, and the lemongrass into the curry liquid. Stir to combine and cook on low heat for another five minutes. Meanwhile heat at least 3 inches of oil in a large wok or pan to medium high. Mix the starch and pepper together on a plate and gently coat the tofu rounds. Fry for a couple of minutes, until the tofu is crispy and starting to brown. Remove from the oil with a slotted spoon and drain on mesh or kitchen roll. Toss the kaffir lime leaves into the hot oil and fry for a few seconds before removing and draining on the kitchen roll. To serve, spread the banana blossom mix across the bottom of a bowl. Top with the tofu and sprinkle with herbs, fried shallot, spring onion, peanut, and any remaining toasted coconut. Pop the fried lime leaves on and squeeze a wedge or two of lime over the whole dish. This was delicious and the first time I’ve cooked with Banana Blossom! I used the outer inedible banana leaves to make a boat for the salad – and two other ones that I served with it. Left the tofu on the side and made some other minor changes based on what I had in the house. (Yes I did use dried unsweetened coconut flakes and dried lime leaves.) I will make it again for sure. The one glitch was I wasn’t sure how much of the banana blossom was okay to eat. A bunch of it was pretty dark and I read on another website to discard any part of the blossom that looks like that. Wondering if that’s the case. Thanks for this recipe from another Messy Vegetarian Cook! I ha a canned banana blossoms. Can I use them?